The industry standard. And for good reason too. 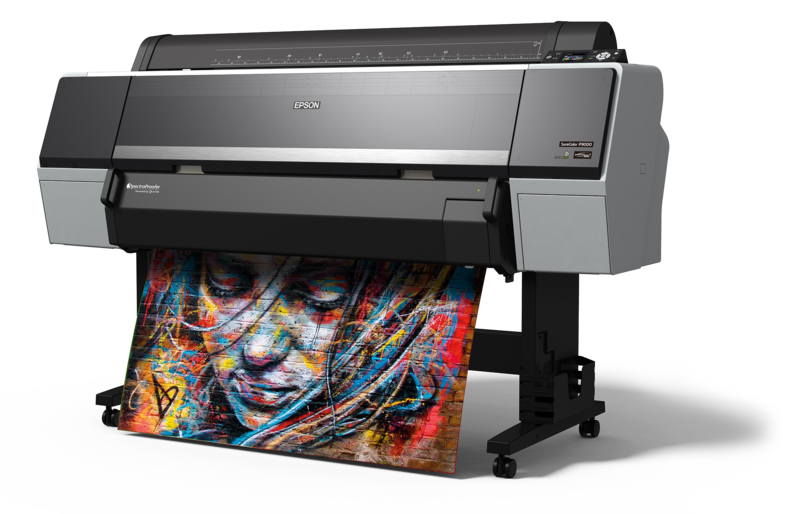 It’s no surprise that these machines have become the market leaders for photography, fine art and proofing applications. The combination of image quality, speed and features make them unbeatable. The previous Stylus Pro range of large format inkjets were already on top of their game. The improvements in the P-Series may not be obvious from the outside but they are more about fine-tuning an already excellent product. In our opinion the most important advance has been in the manufacture of the new print heads, making them vastly more reliable and hard wearing. We have yet to replace a print head on one of these machines. Our engineers are getting worried about their jobs. This is the killer feature for producing contract proofs. The optional SpectroProofer unit adds automated colour calibration and proof verification abilities to your workflows. Developed jointly by Epson and X-Rite, the unit fits cleanly to the front of the printer and houses a spectrophotometer in an automated unit which includes a built-in print dryer to accelerate the dry-down and reading process. The integral X-Rite ILS30EP spectrophotometer supports M0, M1 and M2 measurement modes to meet all current and previous standards. The means, for example that you can produce and verify both FOGRA39 and FOGRA51 proofs accurately. We love this feature because it means we can remotely support our customers, recalibrating and diagnosing colour problems within minutes. All new pigments for an outstanding colour gamut, high black density and print permanence. Black pigments are 1.5 times denser than the previous generation ink set. The new optional Violet Ink for commercial proofing applications helps to achieve 99% of the Pantone System – This increases the ability to faithfully reproduce important brand and spot colours. The range is available in 8 or 10 colour options but, just to confuse things these take 9 and 11 cartridges respectively. The Black ink has a Photo Black and a Matt Black cartridge. Photo black is used for gloss and satin paper and matt black works with matt finish papers and canvases. The printer automatically switches between these two modes depending on the colour profile used for printing. Then we have Light Black and Light Light Black. These are used instead of Black in highlight areas so that very light greys can be reproduced without looking grainy. Then there are Cyan, Magenta and Yellow inks and also Light Cyan and Light Magenta which give smooth tones to pastels and skin tones. The P6000 and P8000 use these 9 cartridges. The P5000, P7000 and P9000 take things even further by adding Orange and Green inks to boost the colour gamut. There is also the option of using a Violet ink instead of Light Light Black to push things even further. We would recommend this for proofing applications rather than photographic. The printers use an automated internal system for checking and cleaning nozzles. This means that these machines can be left to look after themselves. Every few prints the printhead is charged and each nozzle is fired onto a detector grid. If it spots any dropped nozzles it starts a clean cycle. No need for any operator input. The rotary media cutter can cut all photographic and fine art media types. The rotary design means that it remains sharp and has a significantly longer life than previous designs. Paper dust is minimised due to the blade remaining sharp and the cutter unit being housed separately from the carriage and printhead mechanism. Keep track of remaining roll media by automatic printing and reading of bar codes on rolls. If there’s not enough media left to print the job the operator is automatically alerted. We have decades of experience working with Epson technology. Our team has worked with every Epson large format inkjet model over the years. We also know colour management, workflow and rip technology inside out. As well as being an Epson Authorised Dealer, we are also an Epson Service Partner meaning we can service and support your printer even within it’s warranty period.